Many people consider daffodils to be the first sign of spring. The plant has the botanic name "Narcissus,” after the Greek character who was in love with his own reflection. Daffodils are generally a deep, sunny yellow, but you can also find daffodils in a variety of colors such as cream, orange and pink. These cheery flowers will brighten any garden, and perk up your home when brought indoors. Select a pot that is at least 12 inches deep and 6 to 8 inches in diameter. 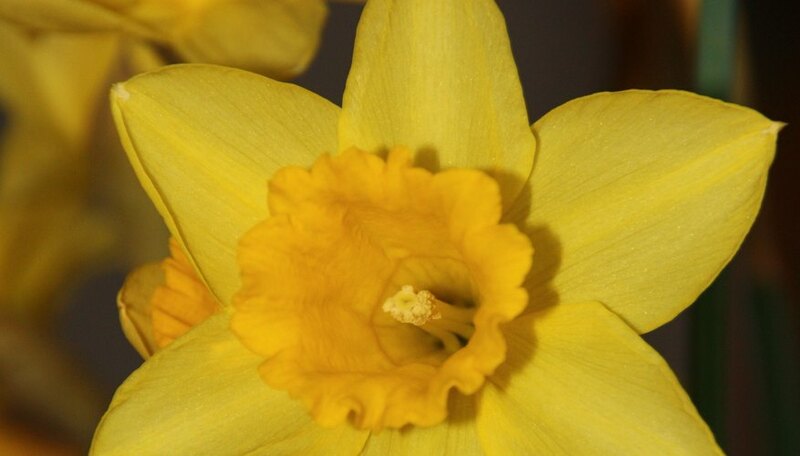 Daffodils require space in which their roots can spread and grow. The wider across your pot is, the more daffodil bulbs you can plant and enjoy indoors. The pot should also have drainage holes at the bottom. If it does not, place small rocks or pieces of broken china at the bottom to provide drainage. Fill a medium bowl with water. Place the daffodil bulbs into the water and allow them to soak for an hour or two prior to planting them in the pot. Fill the pot half-full of potting soil. Plant the daffodil bulbs "nose" up. The nose of the bulb is the pointed end. Add more soil around the bulbs, leaving about an inch between the top of the soil and the top of the pot. When planting the bulbs indoors, leave about 1/4 to 1/2 inch of the nose exposed. Place between three and five daffodil bulbs in the soil, but ensure they are not touching one another. Drain any standing water when the daffodil shoots are several inches tall. Water the daffodils with a mixture of 1 part vodka to 7 parts water or 1 part rubbing alcohol to 10 parts water. Water the daffodils one time with this alcohol mixture, which will stunt the growth of the flowers. This will prevent the flowers from drooping and the stems from breaking. Place your pot of daffodils away from direct light and heat. This will keep the plant from flowering indoors as quickly as it would outdoors, so that you can enjoy your daffodil's flowers for a prolonged period.